I probably should have blogged about this earlier but . . . well, I forgot. Better late than never though, right? I’m a little concerned to have seen this event listed in some places on the internet as a “Singles Event”. Er . . . I’m not sure why. Please note, this is not speed dating (at least, I don’t think it is). It is a book signing. 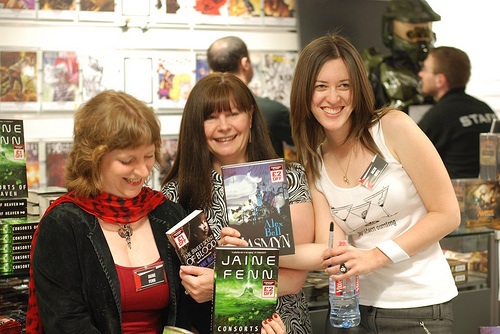 You therefore do not need to bring us flowers to get us to sign books. But you can if you want (I like lillies). *Alex Bell cannot accept liability for any projectile vomiting, choking, burning tongue, personal injury or premature death resulting from eating the Hot Wasabi Peas. Consume entirely at your own risk. Do not consume if you are fatally allergic to peas. 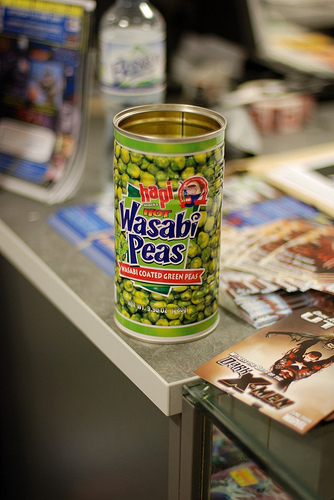 Do not consume if you are fatally allergic to wasabi. Do not inhale the Wasabi Peas or attempt to insert into nostril. Hot Wasabi Peas are for consumption purposes only. **Consumption of one or more peas constitutes a legally binding undertaking to purchase at least ten copies of each of our books, despite any oral representations to the contrary.